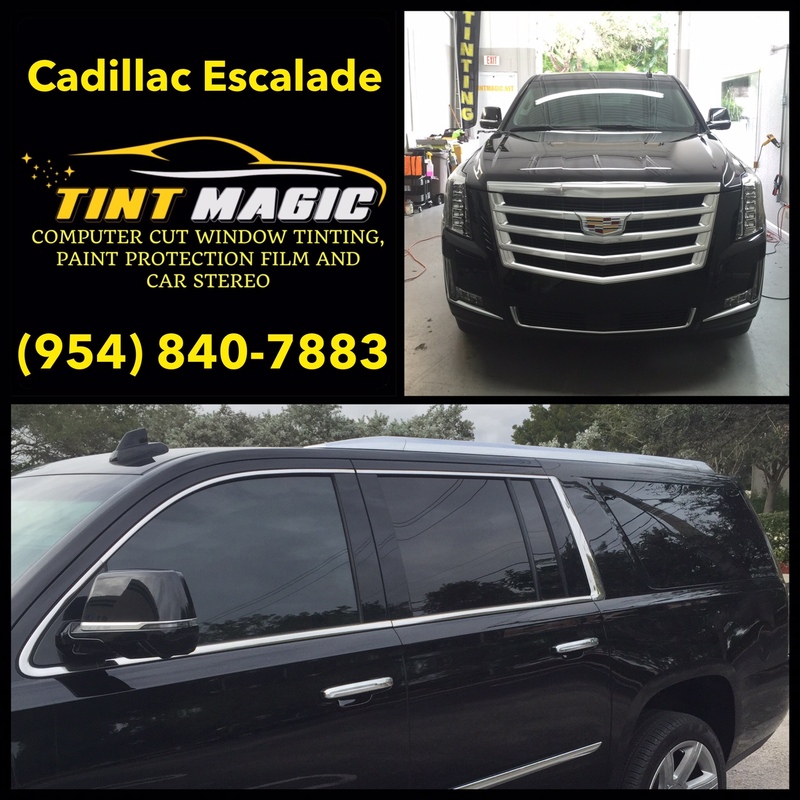 Cadillac Escalade at Tint Magic Window Tinting Coral Springs. We have applied 18% CXP window tint on two front windows and 35% CXP window tint on rear windows for the best heat rejection, UV protection and privacy. Call us for a free estimate! (954) 840-7883. Flashy and glamorous, the Escalade continues to woo buyers with its luxurious interior and lane-busting road presence. Under the hood is a 420-hp, 6.2-liter V-8 paired with an eight-speed automatic transmission and rear-wheel drive; all-wheel drive is optional. The Escalade offers a maximum towing capacity of 8300 pounds. The ride quality is buttery smooth, but the handling, not surprisingly, is less than athletic. The styling isn’t exactly subtle, but it is most certainly iconic. Built on the same truck-based underpinnings as the rest of GM’s full-size SUV fleet, the 2015 Cadillac Escalade initially launched with the recently updated 6.2-liter V-8 mated to a six-speed automatic transmission. Producing 420 horsepower and 460 lb-ft of torque, the engine eagerly shouldered its substantial load, hustling the six-speed-equipped Escalade around town and down the highway with ease. A numerically higher first gear facilitates seamless takeoffs, and the more tightly spaced ratios mean the transmission stays busy even under light acceleration. Yet it shuffles between gears with a precise, almost imperceptible action, rarely letting the revs climb above 3000 rpm. Mat the accelerator at any speed, however, and the tach swings for the cheap seats, the transmission letting the beefy V-8 rev to around 5700 rpm before grabbing another gear. Thanks to the tighter gap between ratios, the engine spends more time in the meaty portion of its torque curve, making the most of its output and lending a more fluid feel to the proceedings.